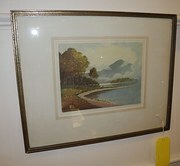 Isle Of Arran Watercolour Mountain landscape, Tom Paterson,signed. Watercolour A Fine Day At Arran P. Macgregor Wilson. Peter MacGregor Wilson Watercolour,Seaside path. E,H,Morton Watercolour Little Bridge unsure of date or title please call for advice. Watercolour The Lake,i am unsure of the proper title,or the date please call for advice.